The Yamaha DVX-1000 promises to be the last word in home cinema, delivering a level of surround sound not heard before from a three-speaker system. Or so Yamaha would have us believe. It claims the DVX will deliver a 7.1-channel experience from just three speakers, a technique Yamaha’s marketing droids have dubbed Air Surround Xtreme. Let’s see if it manages it. The first clue to the genuine power under the DVX’s hood comes when you unpack the sub-woofer, an absolute brute – do not drop it on your foot – with a top vent, large heat sink and 16cm driver. Also housing the 2 x 90W amplification unit, the sub boasts a decent sized transformer, custom-made capacitors, separate analogue/digital sub-systems and shielded digital circuitry, all designed to prevent signal interference. The rest of the system feels equally solid, with other early signs of quality including decent screw-fit cable grips on both the sub-woofer and the speakers. Set up is easy. A 13-pin system cable connects the sub-woofer to the head unit. Wire the speakers up, connect the head unit to your TV and you’re ready to go. The only slight quibble here is that the cable connectors on the sub-woofer are right under the heat-sink, which will make those with chubby fingers struggle a little when connecting the cables. The read-out on top of the machine can’t be seen unless you’re standing right over the unit. However, all the unit’s functions can be accessed from a pretty well laid-out remote and viewed on the TV, so this negates any real control issues. Turning the DVX-1000 on brings the set-up screen into view, with it the straightforward process of entering the various screen and audio options. Happily, most of these can be set to automatic so that the unit will recognise the screen format and audio stream, and select the appropriate settings. But there are some very useful manual adjustments that can be made to get the most out of the system. 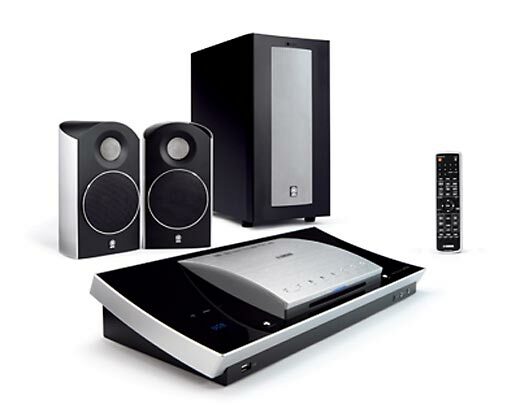 The volume and delay levels on the 100W speakers – an 11cm woofer partnering a 2.5cm soft-dome tweeter with an edgewise-wound voice coil – can be adjusted to fine-tune the system, and you can adjust to a narrow or wider surround stage to accommodate one or many viewers. Yamaha claims that no less than seven different technologies have gone into creating the Air Surround Xtreme effect, the chief of which is what Yamaha claims is the world’s first 24kHz Head-Related Transfer Function (HTRF), which mimics how humans spatially locate the sounds that enter their heads through their ears. HRTF has been done up to 8kHz, but Yamaha says that increasing this to 24kHz enables much more accurate audio imaging. Now, if anyone is going to pull this kind of thing off convincingly, it’s Yamaha. For years, it has busied itself with psycho-acoustic technologies so users of its high-end receivers could make music sound like they were in Carnegie Hall. While some of the past indulgencies could be seen as just that, the technology employed here delivers a really stunning performance. Any concerns about the lack of a dedicated centre channel are dismissed as vocals come over clear and tight. So much emphasis has been placed on the surround effect abilities of the machine we decided to give it a real work-out with the opening destruction scene from the movie Transformers. Bits of shattered helicopter, planes, ricocheting bullets and bits of bone fairly flew around Register Towers. Indeed, from just three speakers the surround level achieved is one of the best we have ever heard from this type of system. The final piece of the audio jigsaw is delivered by the unit’s very capable sub-woofer. 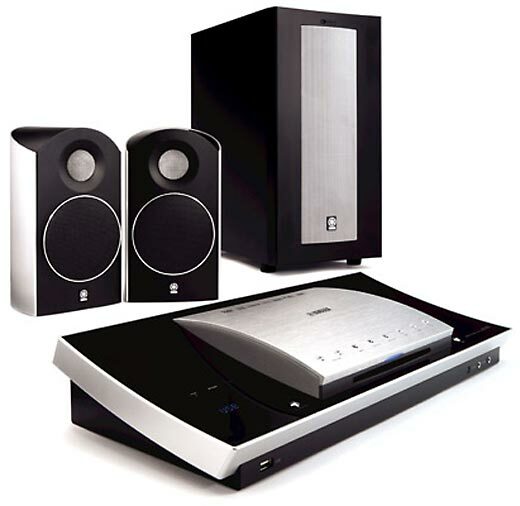 The sub uses Yamaha’s second-gen active Servo Technology (YST II), which is designed to make the sub and the amp work closely together so the speaker delivers as close to linear motion as possible. Indeed, the sub-woofer growls and rumbles in perfect time with the on-screen action and really does deliver that extra dimension of depth and impact which so many subs lack. Another useful audio option is the ability to pick between DVD- and CD-specific settings. Movie mode ensures that dialogue is clear, while emphasising the rear channels. Music Mode is designed to provide full-frequency clarity. It’s also possible to select an Audio Direct mode which cuts the video circuitry out of the signal path and switches off the front panel illumination to lessen any possible audio interference. 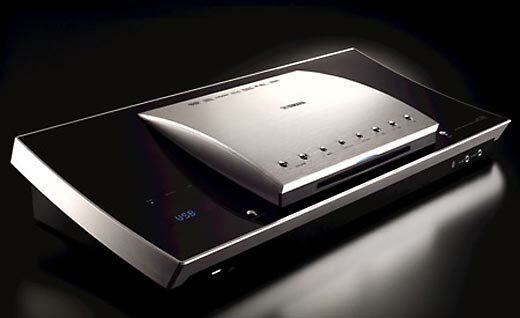 The DVX-1000 also has a compressed music enhancer to improve the quality of MP3 and WMA files. Other audio codecs supported are Dolby Digital, DTS, Dolby Pro Logic II and DTS Neo:6. And there’s a CD up-sampling function that doubles the CD sampling rate to 88.2kHz in an attempt to produce a smoother sound. Yamaha recons this takes the quality of an ordinary CD close to the quality of DVD Audio, and we’d have to say it’s not far wrong. There’s a 3.5mm jack and a dedicated USB port for portable players and Flash drives. Vision performance is also of high quality. You can set the DVX-1000 to scale at 480i/p, 576i/p, 720p and 1080i/p resolutions, and a decently produced DVD fully up-scaled looks so good that a Blu-ray drive looks superfluous, especially while the disc price differential is still significant. DVD navigation is very pleasing – it’s smooth and very quick. The ability to return to the point at which you left a disc, even if it has been ejected from the machine, is nice. The unit can remember the last ten discs in this way, and up to 40 discs can be ‘locked’ so that, for example, parents can prevent their kids from watching discs out of their age-range. The unit can handle DivX and DivX Ultra video, and JPEG snaps on disc or USB stick. Connections at the rear of the head unit include an HDMI interface, Scart, optical digital in, component- and composite-video out, s-video out, analogue (aux) input and line out.